The Zone Records fourteenth release is, unsurprisingly, the calibre you have learned to expect from Italia’s No.1 hard hitting and forth right techno label. “Hard hitting” is apt, as it’s another way of Saying “Impact”, Niereich’s new release on The Zone Records. 2010 saw Niereich break into the techno scene in a big way with his no-nonsense style of pounding kicks, hissing percussion and grand spatial sound settings. 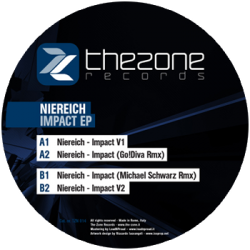 “Impact” sees Niereich offer two original but distinctly different versions of the title track “Impact”, and sees him joined on the release by no less then Go!diva and Michael Schwarz, providing some quality reworks of the original. Impact V1 immediately get’s to work on your aural synapses with immense sounding industrial style hisses which toy with the mind’s mental picture of this futuristic sonic strain. With a rising siren throughout this is sure to cause cerebral chaos in even the most dedicated techno listener. Impact V2 bangs big from the get go, again steam releasing Niereich’s signature hisses over fat kicks and crispy percussion. Well-crafted synths collide to create a track fit for space travel or getting a dance floor ripe for some hedonistic mayhem. The remix by Michael Schwarz is bound to delight the bass hungry with his relentless rework of Version 1 whilst Go!diva’s take is pure filth embodied with its distorted synth lines and colossal tones.